The Cascade Culinary Institute Culinary Arts and Baking & Pastry Arts Programs are accredited by the American Culinary Federation Foundation’s Accrediting Commission. 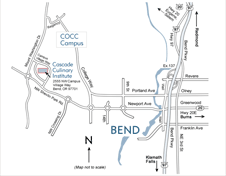 The Commission has awarded Cascade Culinary Institute accreditation thru 2021. Accreditation from the ACF is in a voluntary action by the program. It requires that curriculum, faculty, facilities, resources, support staff, and organizational structure all substantially meet the standards set by the Accrediting Commission. These standards were set by industry leaders in both culinary arts and culinary arts education. Central Oregon Community College is a member of the regional accrediting organization the Northwest Commission on Colleges and Universities (NWCCU). January 2010 the Commission adopted newly revised accreditation standards and a seven-year accreditation cycle. COCC is preparing for a review in the 2018-19 academic year under the new standards and cycle. Also see: Information about COCC Accreditation.